On September 13 and 14 Matthew Smith and Indelible Grace will be at Covenant Life Church leading us in worship. 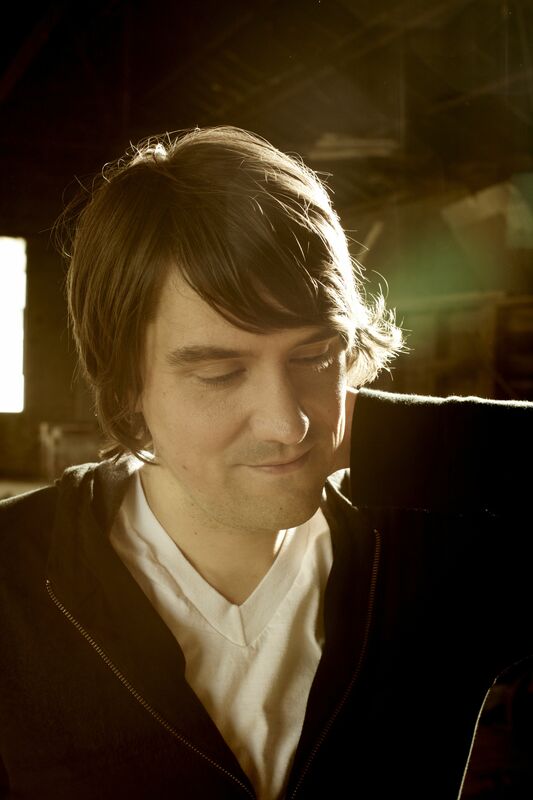 Matthew Smith is a Nashville-based singer-songwriter who writes brand new music to centuries-old hymn texts. He is a founding member of the Indelible Grace community, whose work has drawn acclaim across denominational lines and is used in churches around the world. Born out of a college ministry, the reimagined hymns have found wide acceptance both among college students and the church at large, joining people who desire to honor tradition with those who want a modern musical approach. His latest album is Hiding Place. On Saturday, September 13 Matthew will lead a free, one-hour worship seminar from 5-6 pm, and then Indelible Grace will join Matthew for a Night of Reimagined hymns from 7-8:30 pm. A love offering will be taken during the concert, but admission is free. Sunday, September 14, Matthew Smith and Indelible Grace will participate in the Worship services at 9 and 11:15. His music has a bluesy, earthy feel, matching his rich baritone voice well. I particularly enjoy the Hammond B-3 strains and tube-y hollow-body guitar on his Communion Hymn: Lord Jesus, Comfort Me. At the seminar Matthew will share his vision for re-imagining old hymn texts. Worship leaders, songwriters, and musicians are welcome to attend, as well as any who want to learn more about what Matthew is doing. For more information, go to the event Facebook page. For more information on Indelible Grace, visit their website igracemusic.com. I hope to see you there! The worship music world is full of highly produced and densely layered recordings. How does one listen to a song and adapt that song for their band without using loops and backing tracks? Our worship band is presently without a regular guitarist, something I have not experienced in quite a few years. 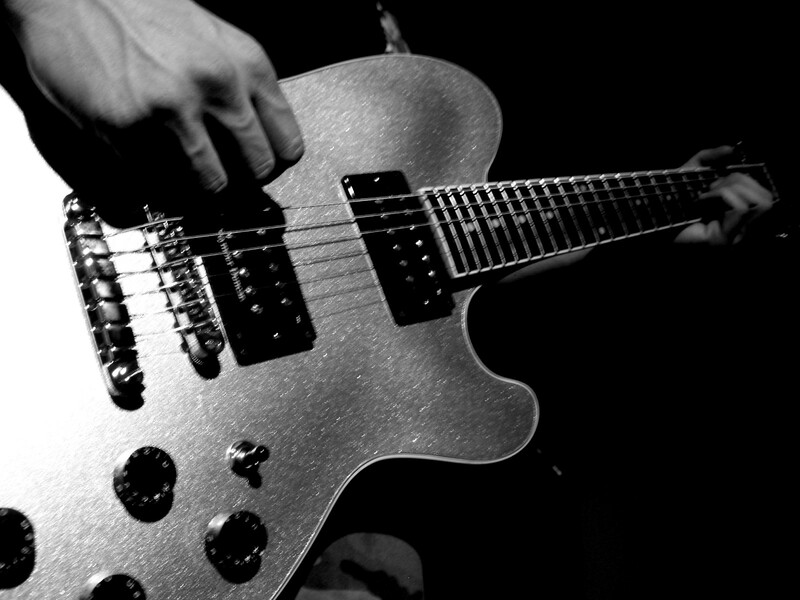 Since most of the modern worship songs are guitar driven, we are adapting songs every week. Here are two steps to guide you when you find yourself in a similar situation. Find the shape of the song. By shape I mean the emotional and lyrical direction of the piece. Does the song follow an arc pattern, building to the middle and relaxing from there to the end? Does the song grow from beginning to the very end? Or is the song one feel without much variation? Mimic the shape. If the song starts soft and builds, begin with just one instrument and a solo voice. At each verse add another instrument or voice. Have the drums start with just cymbals and hi-hat, then let the drummer build to a full groove. Play a pad on the keyboard and switch to piano or organ at a higher emotional point. Have the vocals begin in unison and add harmony at the chorus or a later verse. Your band is not an on/off switch. Your band consists of a certain number of instruments and voices. Please do not begin every song with everyone singing harmony and every instrument hammering away. Thoughtfully choose which instruments and which voices start and what voices and instruments enter in what particular order. You are the leader and you are orchestrating the music as you go. Imagine John Williams writing the music for Star Wars. Instead of arranging the instruments and sounds the way he did, what if he had walked in, plopped down a bunch of music in front of everyone, and told them to play whenever and as loud as they want? Would we want to listen to the music? Any person can lead music like that, but it takes an artist to carefully construct the sound their band or orchestra or choir makes. This week take one song and play it a completely different way. Be creative. Make a plan for everyone to come in differently than they have in the past and see how it sounds. Be an artist, not someone flipping a switch. How do you adapt songs for your musicians? If you have read my blog at all you will know that I am a proponent of notated charts, not of lyrics and chord charts or just a melody with chords over it. What Kind of Music Charts Should I Use? For this post I am focusing on how to chart a song you have not written. Writing a chart for your own song is a different story. A good mp3 or recording. Carefully choosing the mp3 helps your team and helps you. Find a recording that is high quality and that has the style you are looking for. I talk about the role of recordings here. A metronome. I use Frozen Ape on my iPhone, but a simple adjustable tick-tock will do. Software. Gone are the days of longhand. Get Finale. I am a huge proponent of this software and have been using it since 1991. Finale enables you to set templates, play your music back, adjust and edit music quickly, and much more. The learning curve can be steep, but the work is worth it. If you are in a church or academic institution you can take advantage of a huge discount. A basic understanding of music theory. You do not need to be able to analyze symphonies or understand jazz chord structures. You simply need to be able to identify a chord when you hear it as I, IV, V, 1st inversion, 2nd inversion, etc. A good ear attached to a good mind. Yeah, here’s the rub. You can’t use the other tools if you do not have this. You must be able to listen to a recording and distinguish individual parts, and then you have to be able to notate what you hear. This takes practice, but you can do it! Patience and humility. Your first charts will have lots of mistakes. Expect it, and be ready to graciously say, “Thanks for pointing that out. I will fix it,” rather than getting defensive because someone pointed out that you are human. You will get better and more confident as you do this more and more. Before we jump in to the details, let me show you the end product. Here are parts of a completed chart (I’m not posting the whole thing due to copyright concerns, which is another issue altogether). OK, so once you have gotten the tools at hand and figured out how to use them, here are the steps I follow in writing all of my charts. Ready? Figure out the tempo marking with your metronome and a word or two to describe the style. For instance, Rock ballad quarter note = 80. No wussy things like “Prayerfully” or “Hopefully.” Always use words that a musician can act on. Figure out the primary time signature (4/4, 3/4, etc.) and key signature. Both of these can change throughout the piece, but we will discover that as we go. Set up a grand staff. The top one should be Vocal and the bottom one should be Rhythm. I prefer to use a treble clef on the Vocal staff, but a bass clef on the Rhythm staff because I always begin with the bass. More on that later. Enter in all of the data (key and time signature, etc.). In a program like Finale all of this is created for you at the very beginning in the set-up screen. You enter in all of the values and it plugs them right in. Now listen to the recording closely all the way through. Find any places where the time signature changes and notate that on the appropriate measure. Often pop songs will add or subtract two beats in a 4/4 song for interest. There are multiple ways to notate this, but just do what makes sense to you. Next, do the same for the key signature, notating the changes in the appropriate measure. Enter section numbers/letters/descriptors. I give each section a letter and name: “A: INTRO,” “B: VERSE 1,” D: BRIDGE,” and so forth to facilitate learning and rehearsal. Now you should have a complete layout: Vocal and Rhythm staves, time signatures, key signatures, tempo markings, section markings, and the exact number of measures in the song. If the song has an extended ending you just need to decide how much of that ending you want to include. Now listen through the recording and notate the bass line. By bass line I mean the lowest note of the chord, not the bass part. Next figure out the chords over each bass note and enter them accordingly. Once the bass line and chords are entered, in Finale you can use the Clef tool and convert the Rhythm staff to the proper styles. I use slash notation for straightforward, non-syncopated parts; rhythmic notation for parts that are syncopated or require rhythmic precision; and regular notation where I need for a musician to play exact notes. I also occasionally notate the basic drum pattern at the beginning of a section. Now notate the melody in the Vocal staff. 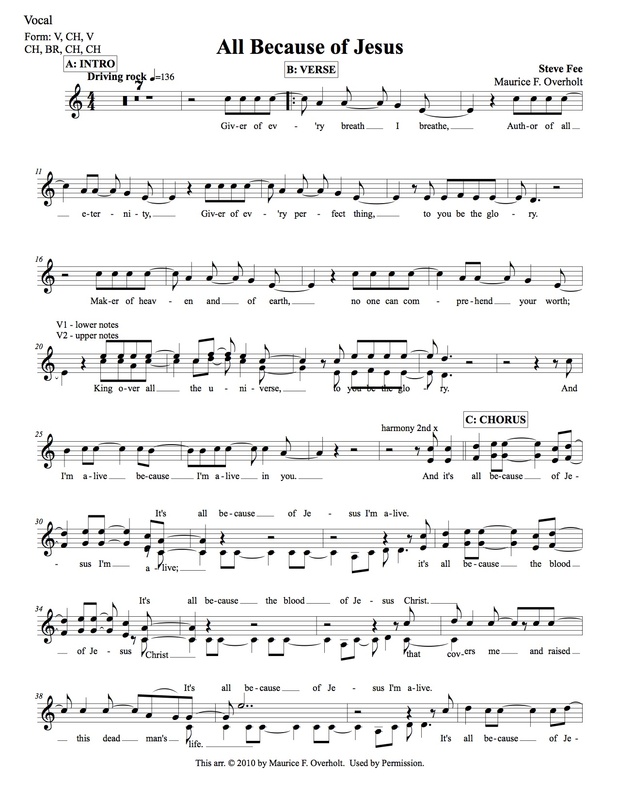 If the melody varies from verse to verse, I generally (not always) make a decision to keep the verses identical in deference to the congregation, who needs to learn the song quickly. By this time you probably have listened to the song a dozen times. Write in directions you want to give the team at certain points to help them. Under the Rhythm staff I write in notes such as “fill,” E Gtr solo (electric guitar solo), “piano only,” “pads,” “kick on 2 & 4,” and so forth. On the Vocal staff I write directions such as “unison 1st x,” “harmony 2nd verse,” and so forth. These directions can save you tons of rehearsal time. 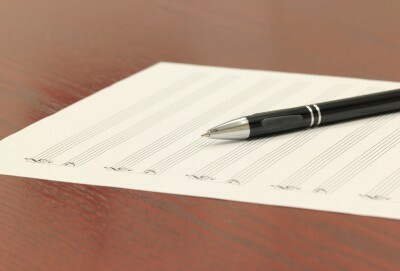 Finally write the form of the piece in the upper left hand corner of the first page so that the band always has a cheat sheet to the structure. Now decide if you are going to sing the song in the key of the recording or change it. 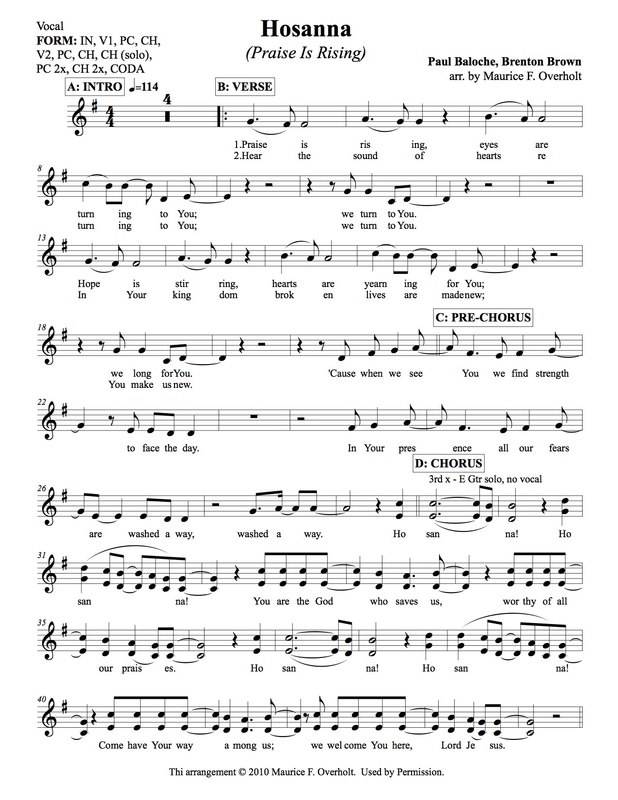 A good rule of thumb is that the melody should go no higher than a “D” and no lower than a “D.” A lot of melodies are rang-ey and break these rules, but the meat and potatoes of the song should be in this range so that the congregation can sing it easily. As you do the final layout of the music on the page, format the chart so that you have lots of white space, reduce the size of the music to 90%, and try to keep the music on two pages. In Finale you can print individual Rhythm and Vocal charts. 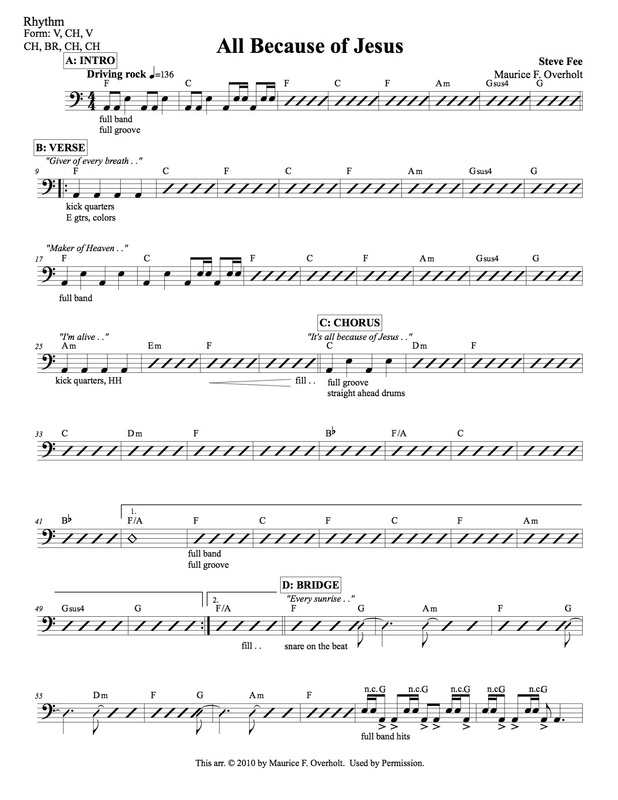 Print out the charts and read them as you listen to the song to find errors. Fix them. Be professional. No colliding lyrics, lyrics covering chords, repeat signs covering the system above, and so forth. Every detail can help you save time in rehearsal by giving you clarity. If you do not have clarity you will waste time fixing it. Get the charts to your band and go for it. This is a lot of information on how to chart a song, and there are a lot of subtleties I have not mentioned, but this is my basic process. I have been developing this process for about 12 years now and I can pump out a basic tune in an hour or two. At the end of that time period I know the song like the back of my hand and am ready to walk into a rehearsal and work with the band. I am considering creating some Finale tutorials, so let me know if this has been helpful to you.